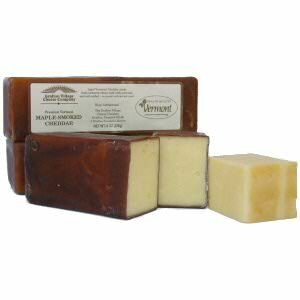 For this Maple Smoked Cheddar Cheese whole, raw milk from Vermont Jersey cows is used. After aging, the cheese is hand cut, double-coated with wax to seal it and then labeled. 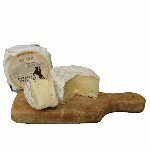 The Maple Smoked Cheddar is bathed in the cool smoke from smoldering hard maple wood for 4-6 hours and will enrich your cheese sauces but tastes as well on a cracker. 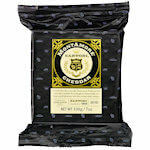 This cheddar was awarded a third place in the smoked cheddar category at the American Cheese Society Competition of 2007 and a first place ribbon in the 2010 competition.